The Beautiful Look Of Wood Siding ..
And The Strength Of Steel Siding . We can agree that not many things look better than a beautiful log cabin. Our TruLog Steel Siding eliminates 99.9% of the problems that accompany wood siding. That means NO rotting, NO splitting, and NO repainting. Once we install your TruLog Steel Siding, you NEVER have to worry about these problems again. Prone to cracking and splitting? Yes No. Steel is the most durable type of siding on the market. Requires maintenance Yes. You have to treat wood siding every 4 to 9 years, depending on the elements its exposed to Very little. Once its installed, you dont have to worry about it. We custom fit the siding on site to get it to the exact inch of your homes measurements. 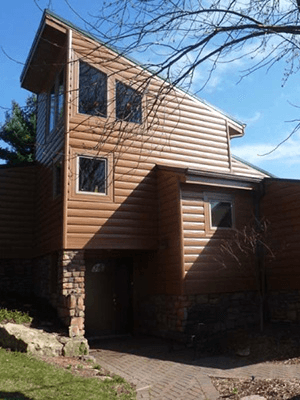 With our TruLog Steel Siding, your home will look absolutely stunning and last for years.